Photo Above: Rain screen siding technology has been in existence since the 12th century A.D. Many of the world's earliest wood structures utilizing rain screen principles were Scandinavian stave churches and Japanese temples. 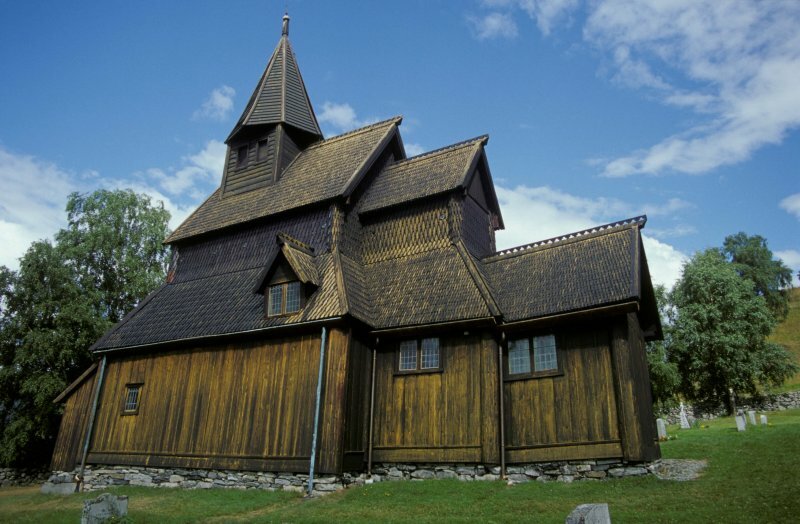 The Norwegian stave church, circa 1180 AD, in Urnes, Norway (above) is still in existence today. The inner wall is first weatherproofed to keep the weather from entering into the interior of the structure (building envelope). 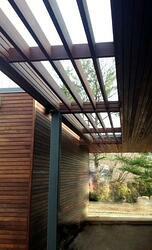 The outer wood siding keeps the weather away from the structure (this siding serves as the "rain screen"). The open space between the layers of the rain screen system allows trapped moisture to escape and also creates an energy-efficient air space that acts as an insulator. This layer helps buffer the transmission of both cold and heat. Removing trapped moisture creates a healthier environment both inside and outside the building envelope. The air space in the wall cavity between the building envelope and the rain screen allows moisture to escape and also creates a passive insulation layer. Unlike masonry curtain wall construction where moisture is nearly trapped in the wall cavity, a proper wood rain screen siding system should be an open-joint rain screen system or a ventilated wood siding system. With a wood rain screen system, moisture from inside the structure passes to the outside and water that penetrates through the joints in the rain screen can also escape. The rain screen siding is the first layer of defense from the elements including wind driven rain. An open joint ventilated rain screen is considered a pressure-equalized system. This means that when winds are blowing against the surface of the rain screen, some of the pressure passes though creating back-pressure. In theory this pressure is exactly equal. In reality there are hardly ever ever "static" pressures; the wind changes directions and pressure (dynamic pressure). The best designed wood rain screen systems have large amounts of unrestricted air flow behind the rain screen and are firmly fastened to the building envelope. In the early 1970's, the first "energy crisis" spawned a new generation of energy efficient weather tight home and building designs. These new super-insulated designs did an excellent job of reducing the energy costs for heating and cooling. They were often so tightly sealed, however, that moisture was trapped within. The need for effective rain screen siding systems was now needed for both residential and light commercial construction. Effective rain screen siding systems solve a myriad of issues addressed in these research studies. While rain screen siding systems do not resolve all moisture issues in a building design, properly designed rain screen systems create an excellent method for moisture to escape through the building envelope while promoting a healthier environment within the structure. A common misconception about rain screen wood siding systems is that they are only effective in keeping rain off the structure. It is true that properly designed rain screen wall systems keep bulk rain water away from the building envelope. It is also equally true that the proper spacing in the wall cavity of a well designed rain screen system is the key to effective moisture management from within the structure. 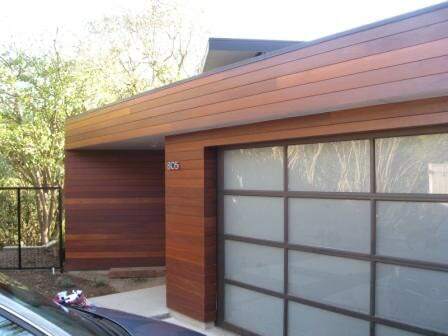 Until recently, the only rain screen wood siding option were designs that required furring strips. Using furring strips in a rain screen siding system creates the proper 3/4" spacing in the wall cavity to allow for adequate moisture elimination. Rain screen systems that use furring strips are considerably better than a non-ventilated wall system. 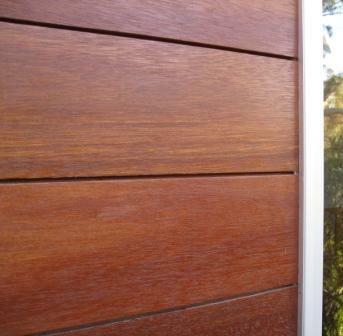 Photo on right shows typical rain screen wood siding detail using furring strips. 1.) Air flow and moisture is restricted to individual wall cavity chambers created between the furring strips. Cross flow of air between the chambers is not possible. 2.) The furring strips provide thermal bridging to the building envelope. At 16" on center spacing, there is typically upwards of 16% of the building envelope surface area in direct thermal contact with the furring strips. 3.) The furring strips trap moisture behind themselves and become a viable food source for mold and mildew. Resultant rot and decay and can create an unhealthy environment and structural damage outside the building envelope. 4.) Additionally the furring strips themselves inhibit the free flow of moisture from inside the building to escape. Since this occurs over nearly 17% of the building envelope, a considerable amount of moisture is trapped inside the home or building. This creates additional opportunities for mold and mildew to develop-inside the structure. This can create an unhealthy environment inside the home. 5.) The labor costs and material costs of a rain screen application using furring strips are considerably higher than alternative rain screen system options. 6.) 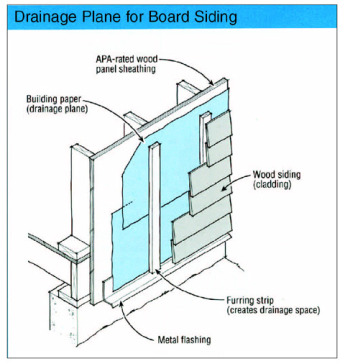 In vertical siding applications, complex furring strip designs are required, often using multiple layers of furring strips. 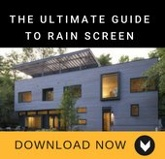 The Climate-Shield Rain Screen Wood Siding System creates a paradigm shift for wood rain screen design. While there are a few rain screen hidden fastener clip systems on the market, none perform as well as the Climate-Shield Rain Screen Wood Siding System. The Climate Shield Rain Screen Clip and the system's patented technology allows architects, builders and owners the ability to design rain screen siding systems for horizontal, vertical or diagonal rain screen siding installations. There is no need to be concerned with designing complicated furring strip layouts. The Climate-Shield rain Screen Clip acts as its own spacer, uniformly, each time and every time. Don't worry about water being trapped behind traditional furring strips when you use the Climate-Shield Rain Screen Wood Siding System. 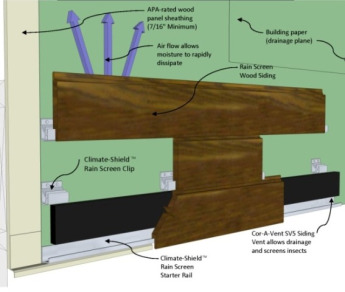 The Climate-Shield Rain Screen Clip acts as its own furring strip - no wood furring strip or "strapping" is needed. The Climate Shield rain screen clip provides the proper spacing off the side wall and can be screwed directly into suitable exterior sheathing. This means that both the material cost of wood furring strips and the labor cost to install them are eliminated from the building budget. This research paper on the subject of exterior ventilated cladding systems explains the building science behind rain screen systems and rain screen siding principles. Take an in-depth look at the damaging effects of trapped moisture and counter measures in this extensive study published by the US Dept of Energy. "Pressure Equalization in Rain Screen Wall Systems"
"This update defines pressure equalization and discusses the various elements that must be incorporated in a PER wall to minimize rain penetration due to air pressure differentials." This "must read" article for architects, builders or owners covers topics such as; why a durable high performance wood building envelope adds value, how to include durability concerns into your design, life cycle cost considerations, and how to minimize the premature deterioration of wall systems and lots more.